The core of the game revolves around building up your own base, to do so players must create various resource production buildings to gain access to the three primary resources which are used to construct all other buildings, train up pirate units and build defences to keep invaders at bay. By establishing a secure base players can compete against the rest of the community to gain dominance over their server and rise up the leaderboard to become one of the best players in the game. 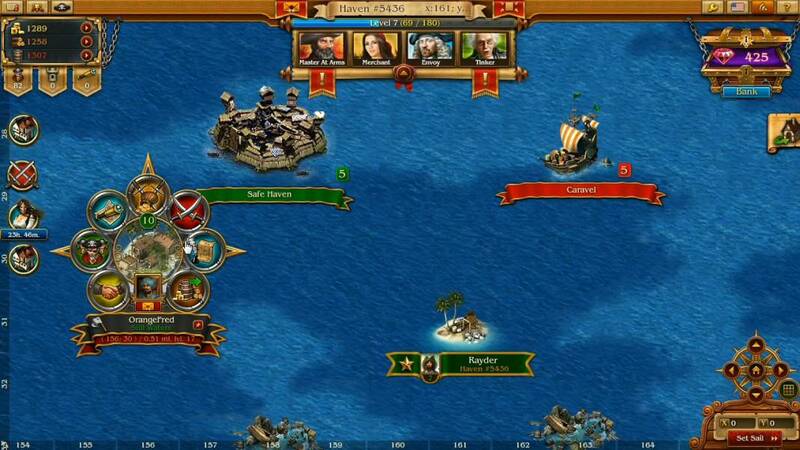 The three primary resources in the game are timber, gold and rum, which for all intents and purposes acts like the food resource seen in other games and is primarily used to keep your units loyal, lacking in rum they will quickly jump ship and look for another captain who can provide for them. Timber is harvested from lumber yards and is one of the key components to constructing other buildings, making it vital to the improvement of your pirate Haven. Finally gold is acquired from the gold mines and is typically used in most transactions and features in the game. Players will acquire resources through their buildings, each of which can be upgraded to make them more efficient, as well as earning them through completing quests and missions. However, the best way to acquire resources is by plundering them from other players Havens and stealing their resources for yourself. To progress through the game players will have to make Discoveries, an extensive technology tree where players must progress through it with an element of customisation where they can choose which technology they will try to acquire next (players cannot unlock a technology until they have unlocked the technologies that lead up to it). Each day players get a number of Sketches from their Tinker NPC advisor that they must stockpile and use to unlock a new technology, which also requires a high quantity of the three primary resources. New Discoveries will open up various new buildings, units and other features in the game to help any Pirate Captain develop their Haven. With these new advancements players are able to begin construction of their own Pirate fleet, creating both offensive and defensive units from frigates to Buccaneers, constructing both fleet and crew. With a strong force players are able to defend their own territory against attacking players, or alternatively send them out to attack either the various NPC ships that serve as quick ways to get an influx of resources and XP, or other Havens (both player and AI). Each unit in the game has its own stats that must be taken into account before making an attack, determining its attacks and defences will give a player an idea as to whether they will be successful in a raid. Once the Pirate Captain has initiated an attack the units will set sail, the time it takes to reach their destination completely depends on how far away it is from the players Haven, combat is completely automated and upon the units return players will know whether they were successful in their attack and what rewards they have gained. With everything in the game players will need resources and have to wait an amount of time to construct buildings or train units, which depending on the quality of the item in question can take anything from seconds and minutes to hours or days. Players are able to instantly bypass this downtime in many situations, instantly completing builds or purchasing new resources at the Smugglers Den, by spending the Rubies premium currency, which can be purchased with real-world money or earned through quests and as players level up in the game.